GAZA CITY -- Whenever 5-year-old cousins Kenan and Nour wake up in their adjoining hospital beds, they beg to see their parents. The tiny pair, now bloodied and bandaged at the central hospital here, are too young to understand the destruction around them. 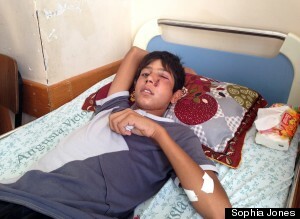 An Israeli airstrike hit their family on Tuesday while they gathered outside to break the Ramadan fast. Nour is now an orphan after both of his parents died in the blast. Kenan's father, 21-year-old sister, and three other members of his extended family were also killed, according to his grandmother, Amal. "We are trying to calm them down," Amal said, visibly exhausted. "We are telling them the war will be over, but they are in shock. They keep asking for their parents. 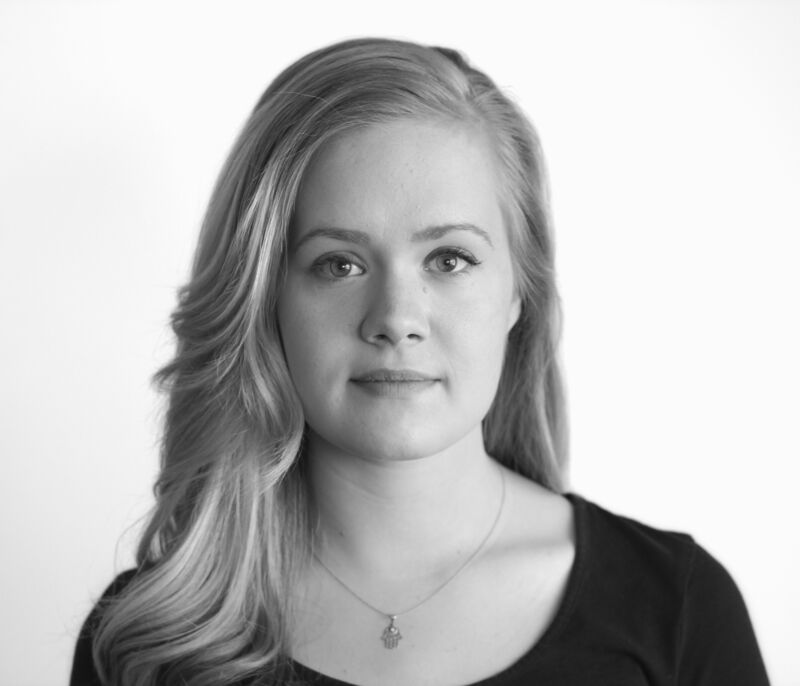 I don't know who will take care of their families now." Kenan and Nour are just two out of hundreds of Palestinians who have been injured as a result of Israel's most recent offensive on the Gaza Strip, which started Tuesday in response to weeks of rocket launches from Gaza. As the conflict continues between Israel and Hamas, the Islamic group that governs Gaza, more than 100 Palestinians have been killed. Dozens of those have been civilians, at least 21 of them children. A few floors below Nour and Kenan at al-Shifa Hospital, 16-year-old Muhammad Abu Taweela is recovering in his room. He stares out the window at the sea -- the sounds of Israeli airstrikes, drones and Gazan rockets are impossible to ignore. His left eye is swollen shut and half his face is puffy due to shrapnel that's lodged in his face from an Israeli drone strike. He said he was playing with friends outside his home in eastern Gaza on Tuesday when a nearby vehicle was hit. 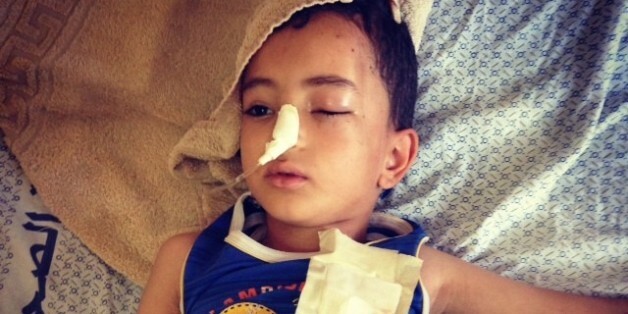 Muhammad Abin Taweela waits at Gaza's al-Shifa Hospital to see if he'll be able to travel to Egypt to get surgery to extract shrapnel from his face. "We were just trying to have fun," he said, his facial injuries making it difficult for him to speak. He's now waiting for permission from Egyptian officials to travel to Egypt for surgery. But he's one of scores of patients seeking such treatment, and the border crossing was only opened briefly on Thursday before closing again. There is an overwhelming sense of desperation among the war-weary hospital patients, many of whom face crushing poverty. The hospital itself is struggling to support the patients and their severe injuries. According to Dr. Ashraf al-Qedra, spokesman for Gaza's Ministry of Health, the hospital has a roughly 55-percent shortage in supplies like gauze and equipment and a 30-percent shortage in medicine. Many hospitals here are also plagued by Gaza’s already dire fuel shortage. Israel has limited the number of trucks allowed into Gaza carrying fuel, food and other essential goods. And most smuggling tunnels from Egypt -- in which people carried everything from weapons to medicine to construction materials -- have been destroyed. Hospital staff say they barely have enough fuel to run generators and ambulances. "We can only survive a couple more days on these supplies," al-Qedra said Thursday in a crowded office at the hospital. Just over the heavily fortified border in Israel, sirens regularly blare across the country to warn people of incoming rockets fired from Gaza. While the southern region close to Gaza has been hit the hardest, sirens in Tel Aviv and Jerusalem have also sounded in recent days. Many have been living in fear that one of the hundreds of rockets launched could kill them and their families. There have been no reported deaths in Israel, largely due to the Iron Dome, the country's anti-missile defense system, which Israeli and U.S. officials say has a 90 percent success rate at intercepting the rockets. In order to bolster its campaign against Hamas, Israel has called up 33,000 soldiers from its reserves. Shuki Haidu, a 33-year-old Israeli tour guide in Jerusalem, got the call earlier this week to report for duty. "I don't want to get into this," he said by phone from his military base in southern Israel, referring to the renewed round of fighting. "My son is in kindergarten. But there's nothing more to do." Unable to explain to his son where he was going, he left him a note simply saying he was "on a tour." The United Nations top human rights official said on Friday that Israel's air campaign might be violating international humanitarian law. But Israel says that it is targeting Hamas, which has been deemed a terrorist organization by the United States, and that Hamas uses civilians as human shields. Many survivors in al-Shifa Hospital said they feel that Israel is targeting civilians as a form of collective punishment, or that the country doesn't care if it kills civilians when targeting a suspected militant. 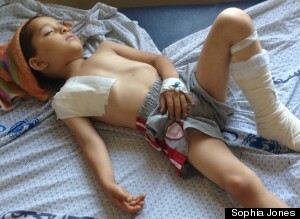 Kenan, 5, sleeps at al-Shifa Hospital after being injured in an Israeli airstrike this week. "Either they thought it was suspicious that there were so many people, or they just wanted to kill as many people as possible," Kenan's grandmother said, referring to the airstrike on Tuesday that killed her son. "The people being killed are civilians!" Shadi, who declined to give his last name, said while sitting next to his injured 14-year-old nephew, Firas Sukar, who survived an Israeli drone attack on a supermarket Wednesday. "It's like Israel can't find real targets," he said, shaking his head. But Firas doesn't seem phased that he almost died. He says he's lucky. He survived, after all, unlike the two boys he said were killed right next to him. And after having emergency surgery to remove shrapnel from his stomach, he's getting better. Firas said he is not afraid of returning home. When asked how he felt right after the attack, he responds simply: "I feel like I was born again." Abeer Ayyoub contributed reporting from Gaza City and Shira Rubin contributed reporting from Jerusalem. The White House on Friday urged Israel and the Palestinians to resume talks and do what they can to protect civilians after Egyptian-mediated negotiations failed to extend a ceasefire and rocket fire resumed. "The United States is very concerned about today's developments in Gaza," White House spokesman Josh Earnest told reporters. "We condemn the renewed rocket fire and we are concerned about the safety and security of civilians on both sides of that conflict," he said. 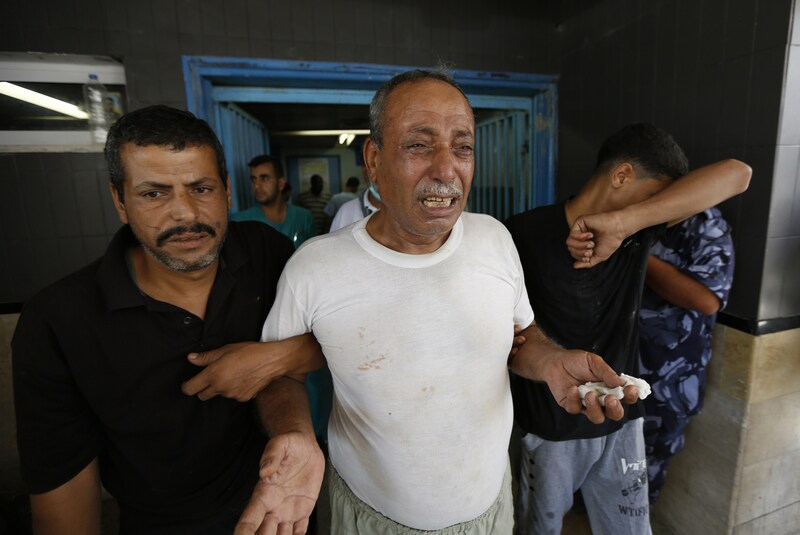 Five Palestinians, including a 10-year-old boy, have been killed in Israeli airstrikes on Gaza since a ceasefire fell apart on Friday, a Palestinian medical official reported to Agence France Presse. Meanwhile, the Israeli army said Palestinian militants fired 35 rockets into Israel on Friday, injuring a soldier and a civilian. Palestinian factions will remain in Cairo and press on with Egyptian-mediated talks despite the end of the ceasefire in Gaza, the head of the delegation, Fatah official Azzam Ahmed, said on Friday. "We are not for escalation. We are ready to continue through our Egyptian brothers in negotiating to reach a final agreement that would return the rights to their owners," Ahmed said. "I mean here lifting the blockade of Gaza." Ahmed said Palestinian negotiators were due to meet Egyptian intelligence officials, who have been mediating the talks, later in the day. He said Palestinian factions were united in their decision not to extend the 72-hour truce that ended at 0500 GMT and had been clear about their basic demands to end the conflict. Egypt called on Friday for an immediate resumption of the ceasefire in Gaza and a return to the negotiating table, saying that only a few outstanding issues remained in negotiations it was mediating between Israel and the Palestinians. "The foreign ministry calls on all sides to rise to their responsibilities ... and to return immediately to the ceasefire commitment and exploit the opportunity available to resume negotiations on the very limited sticking points that remain in the fastest possible time," the foreign ministry said in a statement. BREAKING: Israel says it's resumed strikes on Gaza in response to rocket fire, after end of 3-day truce. A 72-hour cease-fire expired at 8 a.m. today, and not long after, Gaza militants began firing rockets at Israel, The Associated Press reported. The Israeli military said at least 10 rockets had been fired at Israel since the truce ended. Prior to the attacks, a senior official for Hamas said the militant groups would not extend the cease-fire. Israel has conditionally agreed to extend a ceasefire that ended a month of fighting in Gaza beyond a Friday deadline, an Israeli official said on Wednesday, speaking on condition of anonymity. The official did not say for how much longer Israel had agreed to extend the truce, only that: "Israel has expressed its readiness to extend the truce under its current terms," referring to the deal brokered by Egypt that took effect on Tuesday. ABC Foreign Editor Jon Williams reports that the IDF have confirmed the rocket sirens are sounding, but are checking to see if it is a false alarm. #IDF confirms rocket sirens sounding on #Gaza border as Netanyahu speaks here in Jerusalem. Officials checking to see if false alarm. Reuters reports that Israel has arrested one of the suspects in the kidnapping and killing of three Israeli teenagers in the West Bank in June. Kawasme's arrest was made public for the first time on Tuesday in a document from an Israeli court case over whether houses belonging to him and two other suspects - who remain at large - should be destroyed as a punitive measure.